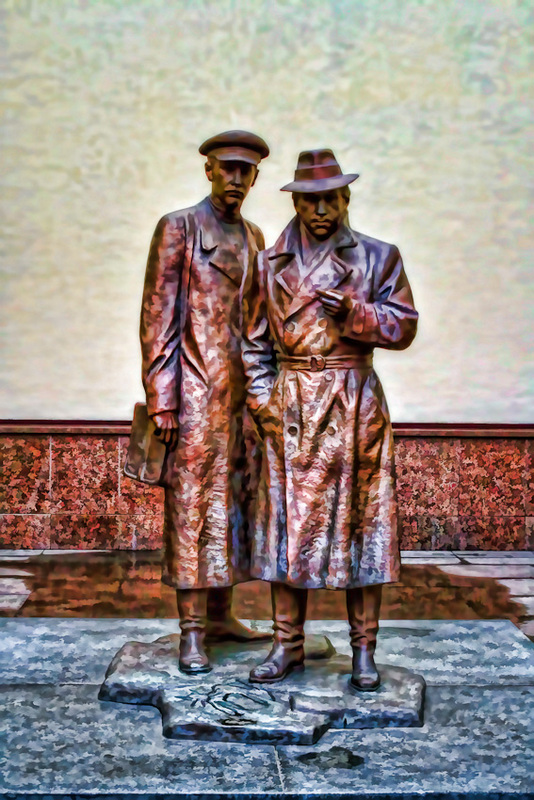 From the first time I saw this statue, I figured it must be some type of monument to the KGB or the militia or something of that sort. I couldn't have been more wrong. Instead, this is a commemoration of a 1979 Soviet television mini-series, The Meeting Place Cannot Be Changed (Russian: Место встречи изменить нельзя, translit. Mesto vstrechi izmenit nelzya). It achieved the status of a cult film in the USSR, and along with Seventeen Moments of Spring it became a part of popular culture with several generations of russophone TV viewers. The original photo had an HDR treatment applied, then some additional work to give it more of a painted look.